Distinguishing between Benjamins “senior” and “junior” in Abbeville, S.C.
It’s important to clarify the father-son relationship between our Benjamin (II) and Benjamin (III). Census and other official records listing them as “senior” and “junior” help with the distinction. 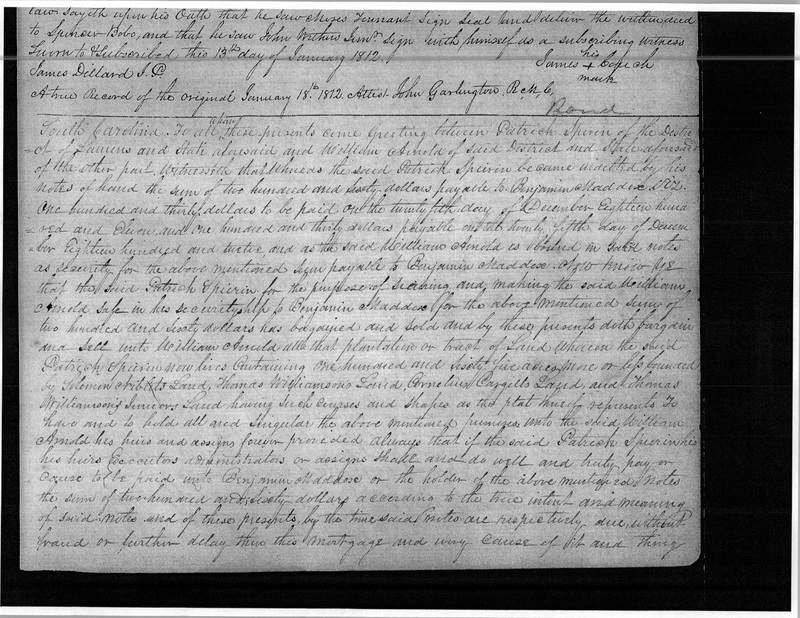 Benjamin (II) is first called “senior” in a will dated 28 Feb 1784, in Charles Co., MD, according to CC Wills, 1780-1791.278, sourced in “Early Families of Southern Maryland,” Volume 9, Elise Greenup Jourdan, Heritage Books, 2007, p. 202. Benjamin (II) is listed on the 1790 Charles County, MD, federal census, but without the “senior” title because his son was only 14 and not old enough to be listed separately. Benjamin (II) sold his plantations – Posey’s Chance and Hornfair – in Charles County and moved to Abbeville County, SC, in 1790. Benjamin (II) also is listed on the 1790 Federal Census in Abbeville, SC (p. 468), which was administered later in the year. Both Benjamin (II) and Benjamin (III) are listed in the 1800 Federal Census of Abbeville, SC, on pages 19 and 22, respectively. Benjamin (III) was 24 and running his own farm by then. Their names still did not include their “senior” or “junior” titles. They’re distinguishable by their ages and the ages of their family members on the census. Benjamin (III) is first officially listed as “junior” in his brother Thomas Maddox’s inventory, taken on 7 February 1805 in Abbeville County, SC (Abbeville County CC Box 12, Pack 1459). Benjamin (II) is listed as “senior” on the 1810 Federal Census of Abbeville County, SC, on roll 60, page 57. Benjamin (III) is listed without his “junior” title on the same census, on roll 61, page 325. Their ages and the ages of their family members on the census again confirm the distinction. Benjamin (III) is listed one last time as “junior” on the estate sale record for his deceased brother or uncle John Maddox on 9 November 1810 in Abbeville, SC (Book 3, page 92). Benjamin (II) is listed without his “senior” title in his January 1811 sale of 165 acres in Abbeville, SC, to Patrick Sperrin. His wife Elizabeth released her dower rights. Benjamin (II) died shortly after his 1811 sale of the 165 acres. One unrelated family historian has argued that Benjamin (III) is identifiable with a Benjamin who was the father of Chandler and Lawson Maddox (who are later orphaned in Georgia), and who lived in Laurens County, SC in ca. 1790-1810. They also argue that Benjamin (father of Lawson and Chandler) moved to Georgia, and later to Alabama, with many other Maddoxes. This historian’s argument has proliferated on the Internet. However, the genealogist Joyce Smelley Odom has demonstrated that Chandler and Lawson were actually Benjamin (III)’s nephews. The Benjamin who moved to Georgia also was Benjamin (III)’s nephew – the son of William Maddox (1776 MD – 1867 AL). According to the War of 1812 Federal Pensioners List, pp. 1246-1247, William and Chandler Maddox of Abbeville, SC, fought in the war. They were nephews of Benjamin III. It’s interesting to note that John C. Calhoun, a progenitor of the war, lived very close to the Maddoxes in Abbeville. According to F. Edward Wright’s Maryland Militia: War of 1812, Volume 5: St. Mary’s and Charles Counties, Benjamin, Frederick, Naolty of M., Notley, Gilbert and William R. Maddox enlisted in the Maryland militia. These men’s relationships to our line have not yet been resolved, but they are likely cousins or nephews of our Benjamin II or Benjamin III. The British invaded Washington along the Potomac River, and Charles County was the scene of some fighting and looting. procession on foot. The men hunted and killed game for food as they travelled and the women cooked it when they camped for the night. They forded such streams as they could and such as they could not ford they crossed on barges made of timber growing on the banks. Their progress was necessarily slow and tiresome. gets in his auto with his wife at his side and their only one child between them turns on the power, presses his foot against the accelerator and dashes across the Great Plains and Rocky Mountains to the Pacific Coast. As the west opened to settlement, American families often moved together to establish new communities. This seems to have been the case with the Maddoxes and the Gaines family, among others. Of particular interest, in the late 18th century the Gaines family was in Abbeville, South Carolina, where they intermarried with Maddoxes and even buried their loved ones on Maddox sites. And then the Gaines family shows up again in Crawford County, Illinois, as the Maddoxes arrived there in the early- to mid-19th century to settle into their farms in the Palestine area. John Napoleon Maddox’s wife was Frances Gaines. It’s interesting to see a familial relationship span centuries. We wonder how close the two families were, and if the presence of one of the families in Illinois drew the other family to settle there. A Gaines family researcher has John Broaddus Gaines – the son of Edmund Gaines (Edmund showed up in numerous Maddox wills in SC) – as a member of the Poplar Springs Baptist Church in Ware Shoals, and buried “at Maddox Mill,’brow of hill’ Saluda River, and 1/4 mile from his son William Balous, “Billy” Gaines mill.” Could some Maddoxes also have been buried at Maddox Mill or at the Poplar Springs Baptist Church? And what the heck is Maddox Mill? Silas Henry Maddox or Henry Silas Maddox (23 Jan 1867 – 25 Nov 1930) married Janie Robbins Gaines on 16 Jan 1887 in South Carolina. Henry was the son of George W. Maddox who was the grandson of Henry Maddox, reportedly the son of Benjamin II. They lived in SC and he died in Norris, Pickens County, SC. In 1900, Henry lived next door to Augustine (Nov 1844) and Louise (Aug 1854) Maddox. He was buried in Zion Cemetery in Norris, SC on 26 Nov 1930. Ref: State of SC Certificate of Death #22397. Robert Gaines, 1776 – 25 February 1864, born in Virginia and died in Pickens County, SC. Wife Frances apparently born in 1780 and died in 1859. Rev. Barnett Smith Gaines, Robert’s son, 20 December 1820 – 31 December 1886, was born in Central, Pickens County, SC. His wife was Margaret B. Whitfield Gaines, also of Pickens County, SC. Ref: 1880 SC census and SC Certificate of Death of Jamie Gaines Maddox #19610. Janie Robbins Gaines, Barnett’s daughter, was born on 25 June 1867 in Central, South Carolina. She married Silas Henry Maddox in 1887 and died on 6 December 1936 in Greenville, SC. Ref: SC Standard Certificate of Death #19610, dated 9 December 1936. Colby Stevenson Maddox was born in Christian County, Kentucky on 24 February 1831, moved to Crawford County in 1850 and died in Illinois on10 January 1891. Colby had eleven children. One was Mary Louisa Maddox, born 15 July 1867 in Crawford County, Illinois. Leander Francis Gaines, Stephen Gaines’s son, was born 1 February 1871 in Crawford County, Illinois, married Mary Louisa Maddox, Colby Stevenson’s daughter, on 9 August 1893 in Crawford County, Illinois. Leander died on 3 December 1946 and Mary Louisa died in 1960 in Crawford County, Illinois. John Napoleon Maddox, 1872 – 1945, married Frances Gaines, 1878 – 1908, on 8 May 1895 in Crawford County, Illinois. George Gaines b. approx 1821 in Crawford County, Illinois. 1850 census Franklin Precinct, Crawford County, Illinois shows George age 28 with wife Caroline, age 25 with John age 2. 1860 census Township 6, Range 10, Crawford County, Illinois shows George age 39 with wife Margaret age 28and John age 11. Interestingly, 1860 census shows George has a one year old son, Leander. Frances Diana Gaines, 1895 – 1908, married John Napoleon in 1895. According to article written about John Napoleon Maddox, his wife Fanny’s brother was Asa Lackey who was Mrs. Elias Brashears father. Fannie Maddox’s birth certificate, dated 1879, says her mother was Ann Melvin. Fannie’s marriage certificate, dated 1895, says her mother was Ann Lackey. Elias Brashear married Sarah Etta Lackey on 28 October 1895 in Crawford County, Illinois. 93,452 Sarah’s father was Asa Lackey, 10 September 1848 – 28 March 1934. Based upon dates, Frances Gaines brother had to be a Gaines. However, it might be possible that John Gaines’s wife’s brother might have been Asa Lackey since he did have a sister, Ann E. Lackey.